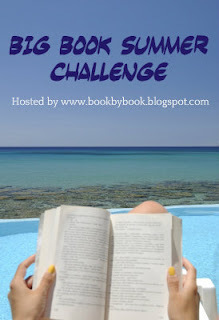 About 7 years ago, I came up with the idea to use the relaxed freedom of summer to tackle some of the biggest books on my TBR shelf that I'd been wanting to read but never seemed to have the time for. One of my book groups takes time off during the summer, so with fewer interfering commitments, I declared it The Summer of the Big Book and really enjoyed delving into some hefty tomes, like The Passage and Pillars of the Earth. It was so much fun that six years ago, I created this challenge so that YOU can join me! And here it is Memorial Day weekend again and the unofficial start of summer 2018. So join in the fun! The challenge will run from Memorial Day weekend (starting May 25 this year) through Labor Day weekend (Labor Day is September 3 this year). Check out my own list of books to read for the challenge this summer. There is a group on Goodreads for the 2018 Big Book Summer Challenge, where we can talk about Big Books and our progress on the challenge. If you don't have a blog, you can also use the Goodreads group to sign up for the challenge, post updates, and show which Big Books you are reading. Yay - so glad this is back. When I put up a post, I'll sign up - but I'm definitely in! Great! Glad you will be joining the fun again, Tanya! Just signed up--lots of long books on my list for this year. Thanks for hosting this again! Glad to have you participating again this summer, Jane! Enjoy your Big Books! Wonderful, Darlene! Glad you decided to join - enjoy your Big Books! Thanks for hosting this fun challenge! I just posted my link. Can't wait to get reading. Wonderful! So glad you joined the fun, Chris! Can't wait to see what Big Books you read this summer. I’m jumping in with both feet. Hoping to finish a couple. I have so many big books, so this challenge is a welcomed nudge. Thanks for hosting!! Glad to hear it, Shaye! Same here - each summer I choose 5 or 6 Big Books from my shelf (I don't always get to all of them) and that barely makes a dent! What a great challenge...have you been to the Drip yet? My husband loves their pancakes! I always forget that we are almost neighbors...we love Letty’s chicken, too! Oh, yes, we love The Drip Cafe - I;ve been there for breakfast & lunch - I'll tell my son what you said about the pancakes, though - his favorite! Our local bookstore, Hockessin Book Shelf, does book group discussions there for lunch each month. Finished my 1st Big Book for this summer's challenge.. The Greek Escape by Karen Swan. Thanks for hosting the Fun, Sue ! Hey, that's great! Are you going to join the challenge? You can post a link in the first links list on this page for your sign-up (even if it is part of another post) and then feel free to also post a link to your review of The Greek Escape in the second links list. I'm planning out what books to put on the list Sue. I have a large print book with 796 pages. Does that count? I plan to join and have even finished one book, but have been just crazy busy over the last few weeks! Great, Cheriee! I was hoping you'd join the fun again! Yes, absolutely that one counts! Sounds like it would be a Big Book even in regular print. And I totally understand about being busy - things have been crazy here, too. No problem - it's still early in the summer! Wonderful, Cheriee! Can you add this link to the first Links List above? That way, others can visit your blog, too! Not at all, Tanya! Welcome to the Big Book Summer Challenge!! So glad you joined thus year :) And I see you already finished Big Little Lies - awesome! Hope that means you are past your reading slump now. I'm not sure I will get to another this summer as I am traveling for the next 2 weeks, but we'll see.